A special press conference was held today with the FBI Birmingham Special Agent in Charge (SAC) Roger C. Stanton. He presented the National Children’s Advocacy Center (NCAC) with the 2015 FBI Director’s Community Leadership Award today. BIRMINGHAM, AL. 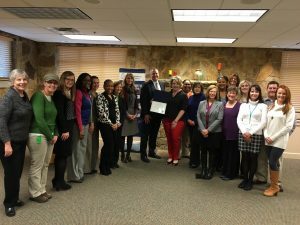 – Special Agent in Charge (SAC) Roger C. Stanton announced that Huntsville’s National Children’s Advocacy Center (NCAC) is the Birmingham Division recipient of the 2015 FBI Director’s Community Leadership Award (DCLA). SAC Stanton presented a certificate to Executive Director Chris Newlin at a press conference today at the offices of NCAC. 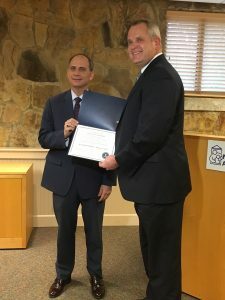 In April, Mr. Newlin will attend a presentation in Washington, DC, where FBI Director James B. Comey will present a formal award to him and other recipients from across the country. Since 1990, the FBI has recognized individuals and organizations whose achievements in the terrorism, crime, drug, gang or violence prevention/education field had an exemplary impact on the community. Each year, the SAC of each FBI field office selects an individual or organization that has made a major contribution in these areas. The NCAC revolutionized the United States’ response to child sexual abuse. Since its creation in 1985, by former Congressman Robert E. “Bud” Cramer and a group of key individuals, the NCAC has served as a model for the 1000 plus Children’s Advocacy Centers (CACs) now operating in the United States and in more than 25 countries throughout the world. The CAC model is built on the foundation that no one agency can independently respond to all needs presented in a child abuse case. It is only with the coordinated efforts of a Multidisciplinary Team (MDT), including law enforcement, prosecutors, child protective services, victim advocates, and medical and mental health professionals that a community, and more completely a nation, can effectively respond to this issue. More than 100,000 child abuse professionals from all 50 states and 33 countries have been trained at the NCAC. In 2015, the NCAC’s International Symposium on Child Sexual Abuse, trained over 1250 attendees from 48 states, the District of Columbia and 14 foreign countries. The NCAC also supports law enforcement in child exploitation cases through forensic and medical services provided to children who may have experienced abuse. “While the FBI and our partners work hard to take predators off the streets and offline, true justice must include those who have been victimized by crime. 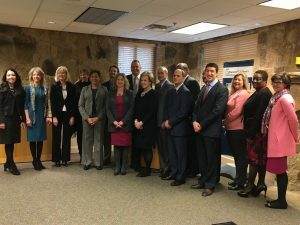 The NCAC has been a long time valued partner to law enforcement in providing help to young crime victims, and the FBI is happy to honor NCAC for their thirty years of service to the community.” Stanton said. 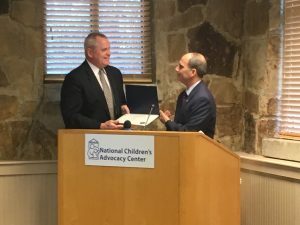 “The National Children’s Advocacy Center (NCAC) is honored to receive the FBI Director’s Community Leadership Award in recognition of our thirty years of service in the protection of abused and exploited children. This recognition is shared with all dedicated current and past NCAC employees and Multidisciplinary Team members who have worked tirelessly over this time to revolutionize our nation’s response to child abuse, and the other 1,000 plus Children’s Advocacy Centers now operating throughout the United States and internationally,” said Newlin.